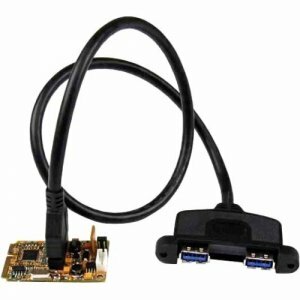 Add two USB 3.0 ports through a Mini PCI Express slot. The MPEXUSB3S22B 2-Port Mini PCI Express USB 3.0 Card with Bracket Kit adds two external USB 3.0 ports to small form-factor systems, for connecting a variety of different peripherals. The card also includes optional standard and low profile brackets to fit a rear expansion bay if needed. The Mini PCIe USB 3.0 card supports the full SuperSpeed USB specification, with fast data transfer speeds (up to 5Gbps), as well as 900mA of power per port, making it a convenient addition for connecting your USB 3.0 peripheral devices. Enhanced with UASP support (USB Attached SCSI Protocol), this USB 3.0 controller performs up to 70% faster than conventional USB 3.0 when paired with a UASP supported enclosure (Note: UASP requires a compatible operating system). Using a more efficient protocol than the traditional USB BOT (Bulk-Only Transport), UASP technology optimizes transfers by allowing multiple commands to be processed simultaneously, significantly increasing transfer speeds for less wait time on data transfers. See our UASP test results below for further details. Using the Mini PCI Express (Mini Card) form factor and offering compliance with PCI Express Gen 2, this adapter card is designed for use in the latest small form factor computer systems, such as Mini-ITX or custom embedded solutions where a standard PCIe card would not fit. Backed by a StarTech.com 2-year warranty and free lifetime technical support. Improved Performance with UASP UASP is supported in Windows® 8, Server 2012 and Linux kernel 2.6.3 or later. In testing UASP performed with up to a 70% faster read / 40% faster write speed over traditional USB 3.0 at peak performance. At the same peak in testing, UASP also showed up to an 80% reduction in required processor resources. Test results were obtained using an Intel® Ivy Bridge system, StarTech.com add-on USB 3.0 cards, a UASP-enabled StarTech.com enclosure, and a SATA III solid state drive.